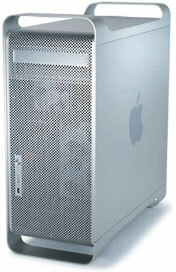 I have been using an Early 2005 dual processor 2.3 GHz Power Mac G5 equipped with 4 GB of RAM and Radeon 9600 graphics. I put OS X 10.5 Leopard on one drive, 10.4 Tiger on another, and this became my secondary production and testing machine at home. It’s a noisy machine, even compared with the noisiest Power Mac G4, but I rarely use it for very long. Most of my work is done on a 2007 Mac mini with 3 GB RAM. I recently acquired five more G5 Power Macs, mostly garden variety 2.0 GHz dual-processor machines. But one stood out from the rest. It needed a special power cord, and when I finally acquired that, I learned that this was the 2.3 GHz dual-core Power Mac G5 from Late 2005. This was the last generation of PowerPC Mac, so a definite keeper. It has 3 GB of RAM and Nvidia GeForce 6600 graphics. Both models use a dual 1.15 GHz system bus. The CPUs in both have a 64 KG instruction cache and a 32 KB data cache. The Early 2005 model has 512 KB of Level 2 cache, while the dual-core Late 2005 machine has 1 MB per core. The difference in Level 2 cache size should give a real boost to the Late 2005 Dual. The first thing I noticed about the Power Mac G5 Dual is that it is a much, much quieter computer. The question that remained was, How much more powerful is it than the 6-month-older model running at the same clock speed? Except for the OpenGL Graphics test, the 2.3 GHz PowerPC 970MP equipped Mac outperformed the 970FX-powered model by 21% or more. Most surprising to me is how much faster that hard drive was with exactly the same hard drive on the same speed SATA bus. How does this compare to my 2.0 GHz Intel Core 2 Duo Mac mini, which is equipped with the same amount of memory, used integrated graphics, and has a notebook hard drive? Surprisingly, the older Mac with its PowerPC architecture wins 6 of these 9 comparisons, and the sequential disk test is awfully close, although the Mac mini does have a newer 7200 rpm hard drive with a bigger data buffer. One real surprise is how well the integrated graphics in the Intel Core 2 Duo CPU does compared with a dedicated video card on a high speed PCIe bus. In the OpenGL Graphics test, the generally maligned integrated video outperformed the video card by 39%, while on Quartz Graphics, the Nvidia GeForce 6600 card took the win by almost exactly the same margin. I don’t have a lot of benchmarking software for OS X 10.5 Leopard. but even if the dual-core model were no faster than its older sibling, I’d choose it over the earlier model simply because it is so much quieter. I’m happy to have both in my collection, but based on performance and sound level, the Power Mac G5 Dual is my new PowerPC test machine.